You can easily navigate the schedule. 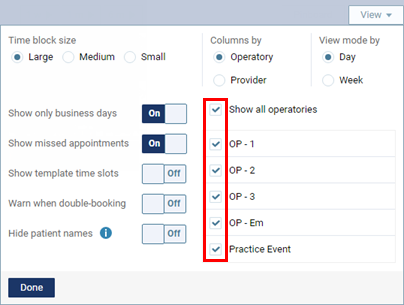 Also, there are multiple ways that you can change and filter the view of the schedule to have it display appointments and events to suit your preferences. View settings are saved until you log off. The Calendar page provides several viewing options. On the toolbar, click (or tap) the month and year to select a date. On the toolbar, click (or tap) the Back or Forward button to go back or forward one day or one week (depending on the view setting). On the toolbar, click (or tap) 1 w, 1 m, or 6 m to quickly go forward one week, one month, or six months from the date you are viewing. On the toolbar, click (or tap) Today to quickly return to the current date if you are viewing a date other than the current date. On the View menu, select OperatorySurgery or Provider, and select Day or Week. Then, click (or tap) Done. On the View menu, select Small, Medium, or Large (Default). Then, click (or tap) Close. Click (or tap) the Zoom out button to view more of the schedule at one time. Click (or tap) the Zoom in button to return to the normal view of the schedule after having zoomed out. The zoom state persists until you log out of Dentrix Ascend; so, as you navigate to other areas of Dentrix Ascend and then back to the schedule, the zoom state that you last selected is used to view the calendar. With the Calendar, if you go below 100%, the last column on the right will not appear. In other areas, buttons may be missing or may not function. Adverse effects may occur if you have an older monitor and decrease the browser's zoom level to see more. Newer rectangular monitors (at a resolution of 1920 x 1080) can usually display up to 7 columns on the Calendar. 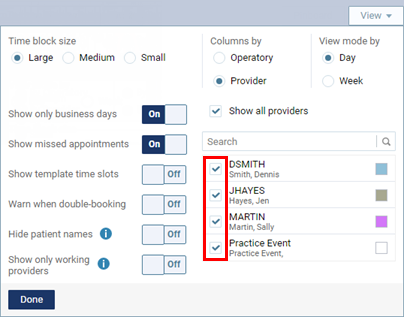 On the View menu, select or clear the check box of any providers or operatories to view or hide the corresponding appointments. Then, click (or tap) Close. On the View menu, set the Show Missed Appointments switch to On or Off. Then, click (or tap) Close. With Show Missed Appointments set to On, missed and canceled appointments (those with No Show and Broken statuses) will remain on the schedule but be translucent and narrower than the width of the corresponding operatory. With Show Missed Appointments set to Off, missed or canceled appointments will not appear on the schedule. On the View menu, set the Show only business days switch to On or Off. Then, click (or tap) Close. With Show only business days set to On, the schedule displays only the days of the week that your office is open according to the location's hours. However, you can still manually select a closed day from the Calendar page toolbar. With Show only business days set to Off, the schedule displays all days of the week. On the View menu, set the Show Schedule Template time slots switch to On or Off. Then, click (or tap) Close. 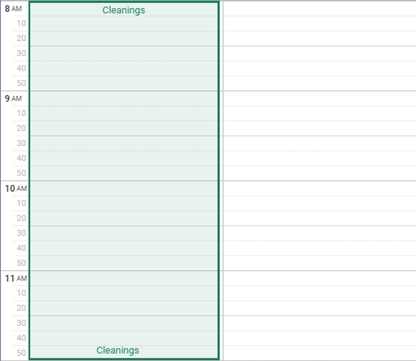 With Show Schedule Template time slots set to On, the schedule displays the time blocks of your scheduling template. However, you can schedule any appointment within a time block; the time blocks are for reference only. With Show Schedule Template time slots set to Off, the schedule does not display the time blocks of your scheduling template. 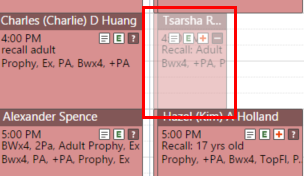 Why is an Operatory or Provider Column missing on the Schedule? Why does the operatory/provider column expand?